Aussie favourite made with Extra Smooth Bundaberg Red Rum. 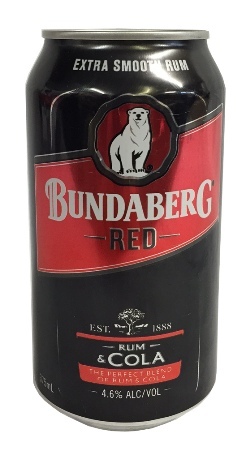 Bundaberg Red is filtered using Red Gum, to give that distinctive smooth taste. Carbonated Water, Bunderberg Rum (12%), Sugar, Flavours, Colour (E150d), Food Acid (E338), Caffeine.